www.cacscwallb.blogspot.com | A plateform of knowledge. Here we are providing the Solved Objective Questions and True / False Questions of Advance Tax Laws and Practice (ATLP) for CS-Final (Professional Programme) Students. 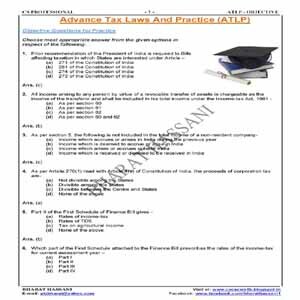 CS-Final (Professional Programme) Students can download Solved Objective Questions and True / False Questions of Advance Tax Laws and Practice (ATLP) of past examinations. Students can download the Questions in PDF file format and practice for their better performance in CS Examinations. © cacscwallb.blogspot.com 2016. All Rights Reserved. Awesome Inc. theme. Powered by Blogger.